Flying Fish are minor, tiny fish-like ghosts that only appear in the Courtyard and Pipe Room in Luigi's Mansion, and in the Ball Room and Butler's Room in the PAL and 3DS versions of the Hidden Mansion. 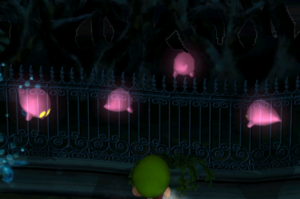 Pink Flying Fish pop up in groups and fly around the place, trying to hit Luigi. This causes five HP of damage to be lost for each hit. Like mice, they have no HP (as opposed to zero HP like Ceiling Surprise or Purple Bomber) and can be sucked up easily by the Poltergust 3000. The Flying Fish found in the Pipe Room are identical, except they are green and considerably faster than those found in the Courtyard. This page was last edited on November 17, 2018, at 19:07.